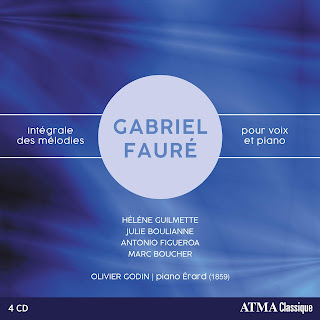 Regular readers probably know by now that I have been following pianist Malcolm Martineau’s project with Signum Classics to record the complete songs of Gabriel Fauré. By my count the project is 75% complete, having already issued three single-CD volumes. However, exactly a month ago today the Canadian ATMA Classique “scooped” Martineau with a four-CD collection of all the songs in a single package. To be fair, Martineau probably has the upper hand when it comes to “star power.” His name is likely to be familiar to anyone who makes it a point to attend vocal recitals; and such enthusiasts are like to recognize (and probably enjoy) most, if not all, of the many vocalists that Martineau recruited for his project. The names associated with the ATMA Classique recording, on the other hand, will probably be less familiar. In this case the project was made possible by the Canadian Festival Classica and its General and Artistic Director Marc Boucher. There is again only one pianist, Olivier Godin; but also there is only one singer for each vocal range, Hélène Guilmette (soprano), Julie Boulianne (mezzo), Antonio Figueroa (tenor), and Boucher himself (baritone). Nevertheless, this new release is likely to have greater historical impact than Martineau’s project. Most important is that this the first recording to account for each of the songs in terms of the keys and voice types designated by the composer for their first performances. Furthermore, to provide a better sense of what Fauré had in mind, Godin is playing an 1859 Érard instrument with a tuning pitch of 435 Hz, rather than today’s standard 440 Hz. To add yet another jewel to this heavenly crown, it should be noted that Fauré himself played an Érard piano. Godin’s piano was made available through the Arte Musica Foundation at the Montreal Museum of Fine Arts. 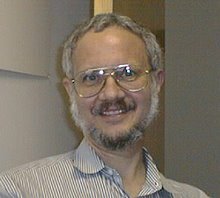 Many readers probably know by now that I am a sucker for historically-informed performances. So it did not take much to bring my attention to this package. However, I should also add that this collection has a “convenience factor” that has been missing from the Signum Classics releases. On the ATMA Classique CDs, all the songs appear in order of their respective opus numbers, while I have never managed to catch on the logic behind Martineau’s ordering, other than to speculate that it has primarily to do with the vocalists he recruited. To be fair, that ordering issue is not really a big deal for me, since I have indexed everything in the Classical Music catalog tool on my iTunes! Nevertheless, I would suggest that Boucher’s project allows one to listen to any individual song with a better sense of the context in which it was written.